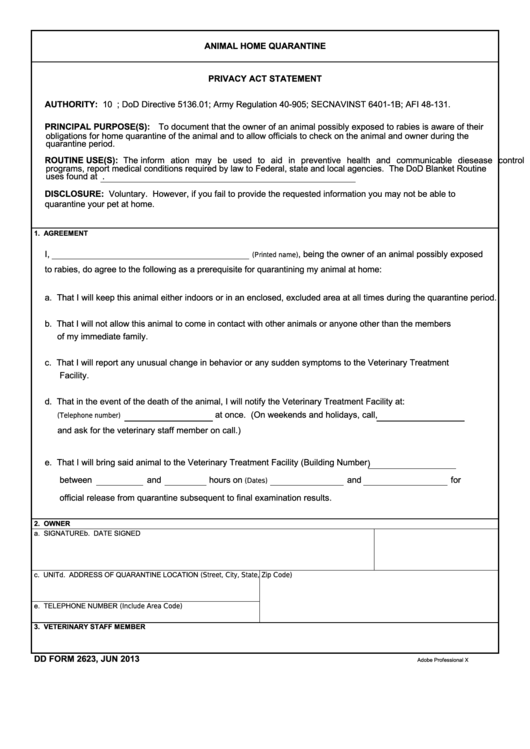 Download a blank fillable Dd Form 2623 - Animal Home Quarantine in PDF format just by clicking the "DOWNLOAD PDF" button. Complete Dd Form 2623 - Animal Home Quarantine with your personal data - all interactive fields are highlighted in places where you should type, access drop-down lists or select multiple-choice options. AUTHORITY: 10 U.S.C. 136; DoD Directive 5136.01; Army Regulation 40-905; SECNAVINST 6401-1B; AFI 48-131.
uses found at may also apply. quarantine your pet at home. a. That I will keep this animal either indoors or in an enclosed, excluded area at all times during the quarantine period. official release from quarantine subsequent to final examination results.